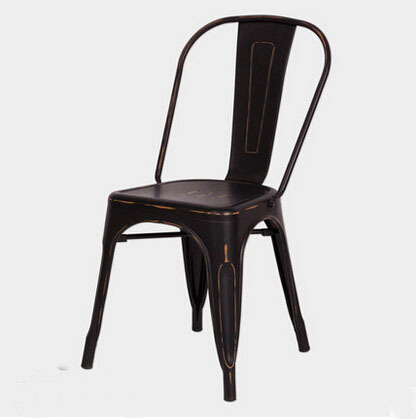 Vintage effect chairs – Black Vintage Side Chair Dimensions: height 85cm, depth 46cm, width 45cm Available in a range of beautiful colours Stackable up to 8 chairs high Not reccomened for long term outdoor use as colours may fade with continuous use DESCRIPITON	The bright glossy finish is available in many beautiful colours. The Painted finish is a great way to add energy and colour to any room. The chairs are fully powder coated using a mixed epoxy-polyester thermosetting paint. The Chair is an essential component to any home, restaurant or commercial premises.